General comments: Part of the new wave of curry restaurants opening up in the centre of Manchester, Zaika sits in a slightly hidden location off the square by the Great Northern Tower, next to new-ish bars Taps and Epernay. After Shimla Pinks shut (sniff), one of the managers came to Zaika to give them the benefit of his experience, and it was someone who spaceman and schoey know well from many Shimla Pinks visits, so we had fairly high hopes. He was not apparent in the 2011 visit, however, which was the first of the franchised Curry Nights. Spaceman discovered in 2018 that this venue had closed, but it is not clear when this happened. 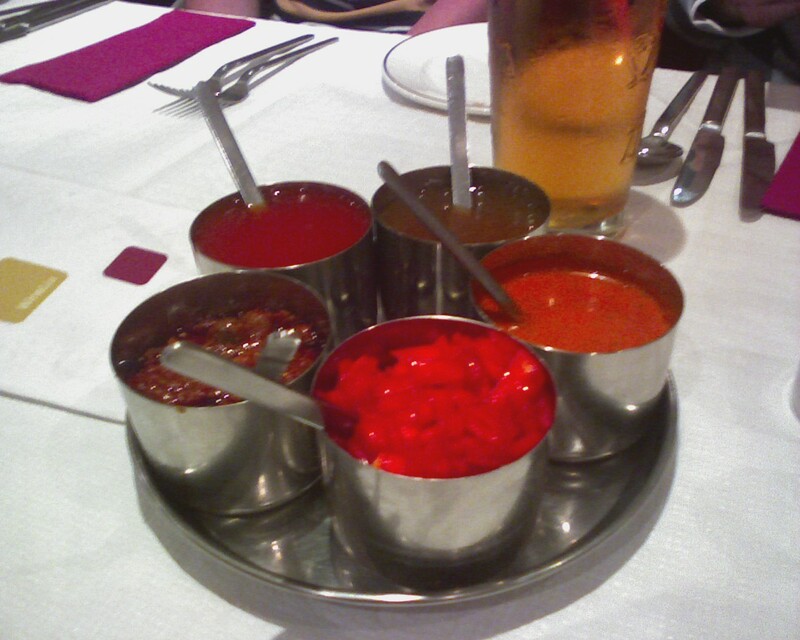 "Having missed the last few curry nights the lure of Taps and Zaika could not be resisted. Their proximity to my abode making it particularly appealing. Every time I visit Taps I decide I like it and threaten to go more often. All bark and no bite. I don’t think I have been there for about a year. Although the [spaceman]melonfarmer himself couldn’t adjust to the reverse pint pulling from the wrong side of the beer tap and the table wasn’t designed for 15 it was a good choice for a pre curry watering hole. Full marks to the apprentice for that choice. Zaika itself is a typical city centre curry house – fancy décor and dishes. Gone is the traditional peeling wallpaper and the chipped plates so common on the curry mile. It is a change for the better. Anyway, to the food. Between ordering my starter and it coming I had forgotten what I ordered so there was little chance I was going to remember what I had the day after. And I haven’t. It was nice though. To add a little detail it was some form of kebab - spicy. (I did say a little.) Accompanied by a side salad which included a slightly out-of-date half tomato. Otherwise enjoyable. For mains I went for a lamb jalfrezi. Nice. Good heat. Solid choice. Rice was good. Naan I didn’t think was. Where were the chapattis?! [spaceman kept it simple with a mixed naan order but accepts the criticism. That said, you could have asked for some. We had to ask for extra naans for like the first time ever.] Special mention to Litmus with his tomato soup and korma – a true man. The waiter also deserves a mention for quickly calculating that 30 poppadoms would be sufficient for a table of 20 given my request for 1 and a half each. The dips for the poppadoms were nice actually – a flavoursome four of mango chutney, yoghurt-based white stuff, some green stuff and the onions [you should go on the Masterchef taste test]. They deserve a mention also." "Overall I thought the curry house was good, my selection of food (tomato soup and korma) came under intense scrutiny [with good reason] but I didn't let peer pressure deter me from my preference. Perhaps bread would have complimented my soup (not provided) and there was a distinct lack of lamb in my lamb korma. But on the whole I liked it. Taps; an ingenious idea in my opinion, although quite slow service for those not drinking beer. Flawed perhaps slightly with the Strictly Come Dancing-esque rule "if you pour the pint wrong[ly] you will still be charged" [eh?]. Brungerio and spaceman therefore cost us several pounds in useless froth from the pump. Otherwise, I enjoyed the experience. The night in general, aside from the abuse on food selection (there was talk of a black list?) was very enjoyable. [Penny]'s "lets get everything" policy when ordering rice/popadoms/naans was a particular favourite of mine. A quick pint in Bar 38 to finish rounded things off nicely!" "Zaika's rather good - fishy starter (Zaika Special Samundari Khazana [bet you looked that up]) did make my Cobra taste a little odd, but the daal makhani was top. Good naan too. [Likesa]'s not very good at naming celebrities who have food linked names, but can organise a good curry night. Taps gets big plus points for having bottled Goose Island IPA." "It were good. Sam says so too... Food was very tasty as is often the case with city centre establishments although it lacked the wires-hanging-out-of-the-wall charm of Rusholme. The waiters should work on their pronunciation so crises such as Sam's meat samosa being presented to vegetarian Keith causing Keith to look extremely dismayed, which only took a turn for the worse when Sam handed the rightful veg samosa across explaining that she had already 'decorated' the plate. Sam was then truly devastated to learn that she had used all of the dip in the aforementioned decoration and thus there was none left. Sob. Location and ambience - bonus points for being close to my flat, it was quite loud (I'm conscious of these things following my narrow escape from being vocally disabled) and we could have done with a bit more elbow room if we wanted to all read a menu at once. Pre-meal entertainment - Taps was also enjoyable, the cocktails were yummy although I'm sure the taps system is a recipe for financial ruin particularly when 'but I did a really good one last time' Brungerio and 'oops I did it again' spaceman are involved [hey, it's harder from the wrong side]. They've clearly spent far more of their time ordering pints rather than pouring them [amen to that!]. Social value- watching the development of Litmus and Batfink's bromance was entertaining as usual, as Litmus accessorised his girly cardigan and green wicker shoes with a girly korma (not the promised vindaloo) and tomato soup, and the tale of the recruitment event when two over enthusiastic students asked for a photograph with Litmus in front of the actuarial flag was shared." "Starter was some spiced lamb blobs, which were decent - soft and blessed with good accompanying garnish. Saag chicken main was nice enough, but a little flat. Didn't truly inspire. Peshwari naan was excellent, though I'm sure I'll be much criticised for my sweet tooth. We should order more in future. Garlic doesn't always inspire as it ought to, I'm sad to say. The rice was of a good standard. I was keen to revisit Zaika to update my views, but I think I've now resolved that it isn't a leading light amongst the town venues. If it wasn't that I liked Taps - the concomitant pre-curry drinks venue, I probably wouldn't have voted for it under the Taylor Franchise system, but there we are! It's ok, but that's not enough for a dilettante such as myself these days. Basically, I've lost touch with the common man. Oh god, what have I become. Surroundings were nice, as befits the town centre, but I do fancy an imminent return to Rusholme [yeah, we're due]." "This place looked modern: aiming at the Akbars / EastZEast market. Nice and clean (although there was a faint smell of Calamine lotion in the loos [not textbook]). I thought service was very good. They left just the right amount of time between courses. Food was fine too - no nasty food colourings and nice fresh ingredients. I had a chicken sizzler of some description for mains and liked it. However, the other half had Rogan Josh (I think) which came with lots of really hot chillies so I don't think he was impressed. Felt it was a tad expensive [this was partly due to excessive alcohol consumption, but the food is on the pricey side] and not as good as Akbars, but I would go again. 3.5 out of 5 (or 7 out or 10!)." "Another of the new breed of city centre curry houses - nice inside, quite inkeeping with the nearby Taps and Epernay. Our long table didn't feel squished in somewhere, which was nice. Dips were in plentiful supply, which I admire in a curry house, with rather nice poppadums, so I was in a good mood from the start. Nothing to do with the beers already consumed with a client's football team, and even less to do with the shared shower arrangements that directly proceeded that [steady]. I started with the lamb chops (in Zaika, not the shower) which were very enjoyable without being revolutionary, and followed up with lovable staple Saag Gosht (I think - it has been some time. Why didn't anyone chase me for this review? [Don't get me started.] I'd have FLAGGED it and everything, then! ), which was done rather well - upper quartile of Saag Goshts (Goshti? Goshtae?). A solid city centre performer that would definitely stand further investigation, it's not my favourite, but if I'm in Taps and curry-minded, then I doubt I'll look any further than this place [that is, if you are able]. However, they do say in different places on their website that Zaika "translates quite literally as" both 'sophisticated flavours' and 'sense of taste', which makes me doubt their authenticity. I could be wrong, but they're guilty until proven innocent in Brunginho's court, and for misusing 'literally' I can't possibly give them more than 4 men in a shower area out of five. Or perhaps that should be one, rather than zero, if lots of men in your shower is bad. One/Four out of None/Five. Literally. [I've no clue how to translate that to a score not involving men. In a shower area.]" "Ahhh yes, Zaika! Well it's always fun to walk into a restaurant and know the manager. Not that we 'know' him but we were regulars at his previous employer so it's nice to see a friendly face. Not my first visit to Zaika, I would go again, it's decent. It's just a shame that nothing will ever live up to the dizzy heights of Shimlas. So, I had a fish starter which was nice but was very very very hot! And I think I can eat a moderate amount of heat but this was too much, so much so I couldn't finish it. Bordering on the uncomfortable. No point doing that with fish, you still want some of that fishyness, otherwise you might as well have some non-descript meat in there. I have no idea now what I had for main course but I do recall it was nice, accompanied by decent naan. The bill situation was a bit dodgy - charging us for 11 of one main course instead of 1! Good job spaceman was on the case [unusually eagle-eyed, in fact]. One hopes to god this was an innocent oversight. They do well to accommodate large groups. We were being positively saintly compared to the other large group at the other end of the room. Over-drunk middle-agers who were mainly flashing too much flesh. They all just piled on top of each other by the end. Enough to put you off your hot fish! Overall, would recommend to a friend."